Manfrotto has expanded its choice of roller bags, extending the Pro Light Reloader range to include six different options which are all of the right size to be count as cabin baggage on most airlines. While the best camera backpacks might be more travel-friendly when you're covering long distances on foot, a roller bag is much more airport friendly. 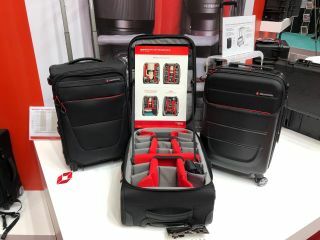 Four soft-top models were announced at The Photography Show – to join the hard-case roller bag models that were announced last year. These include the Pro Light Reloader Switch-55 which can be worn as a backpack as well as used a roller bag. And there is also a new four-wheeled version, the Pro Light Reloader Spin-55, which allows more stability and more manoeuvrability than with standard two-wheel bags. An update of the Manfrotto Pro Light Reloader-55, The Air is designed to fit a pro DSLR with a 400mm lens attached, a second body and up to 3-4 lensesFront and side pockets maximise the capacity, and it is equipped with 2 internal panel see-through pockets for small accessories and an easy-access front pocket for a 17’’ laptop and personal belongings. The 3 digit combination lock keeps your gear secure, and with 19 dividers to absorb shock, your gear will be protected on the move. The external fabric is water repellent and a rain cover is supplied in case of extreme weather conditions. The Pro Light Reloader Air-50 is not as deep as the Pro Light Reloader Air-55. It can fit a pro DSLR with a 70-200mm lens attached, a second DSLR body and up to 3-4 lenses, as well as a complete premium CSC kit. Additionally, it is equipped with 2 internal panel see-through pockets for small accessories and an easy-access front pocket for a 15’’ laptop and personal belongings. It comes with 12 protective dividers and 2 CPS dividers to fully absorb shock, as well as the combination locking system. The retail price is £299.95 / $374. The internal EVA moulded tray provides a solid structure with 14 protective dividers and 2 CPS dividers to fully absorb shock, as well as fixed TSA technology with an integrated 3-digit lock. The water repellent bag comes with a rain cover. Retail price is £349.95 / $429. This is the fashion conscious version of the range. Featuring a polycarbonate external shell and an internal EVA moulded tray, maximising its capacity and lightness and minimising shock, the Spin 55 provides full protection of valuable photographic gear. It incorporates four double spinner wheels that help professional photographers and videographers transport heavy gear, making it easy to manoeuvre in the most crowded spaces. The Reloader Spin 55 can accommodate a Pro DSLR with 70-200mm attached, a second DSLR body and up to 3-4 lenses, a premium CSC with additional lenses. In addition, it can fit a DJI Mavic Pro combo kit and a 15in laptop, which is accessible via a fast front access. The Pro Light Reloader Spin-55 has a solid structure composed of 14 dividers to fully absorb shock, as well as fixed TSA technology with an integrated 3-digit locking system. The internal configuration pouch can be used as a photo protective compartment, or easily removed to turn the Reloader Spin into an everyday travel bag for a 2-in-1 travel experience. When using the Reloader Spin-55 as an everyday suitcase, the inner cross ribbons can retain personal items and prevent them from moving. The recommended retail price is £349.95 / $440.